“Flashback’17” is a look both into the past and the future with the pause in the present. In 2017, we’d like to remember the best works and presenting their retrospective, as well as to show the new projects by the participants of the Festival previous editions. After all, a flashback is a deviation from the routine for a look back. This year our audience will see video works of 47 Russian and foreign artists. At CCI Fabrika Olivier Hall we will present the namesake exhibition “Flashback’17”. It comprises new works of artists already participated in the Now&After Festival, including the previous editions’ winners. “Flashback’17” exhibition is dedicated to memory. Participants of the exhibition: Leila Alaoui, Morocco, Crossings / Natasha Dahnberg, Baggage, Sweden / Vica Ilyushkina, Maya Popova, Lost Fragmets, Russia / Mairéad McClean, Mary | Encode Series 1, UK / Alexandra Mitlyanskaya, Face Book, Russia / Benjamin Ramírez Pérez, Body Snatcher, Germany / Maryam Tafakory, Poem and Stone, UK / Clemens Wilhelm, When You Change the Way You Look at Things, the Things You Look at Change, Germany. Video Art Festival Now&After annually presents a review of the world’s contemporary video art to a wide audience. Now&After was held at the Moscow Museum of Modern Art (2011-2013), at the State Museum of GULAG History (2014), at the State Museum of Architecture (2015) and at the State Darwin Museum (2016). Since Festival’s first year we received 4,500 applications from 80 countries across the world from Colombia to Australia. 209 artists from 42 countries have become Festival’s participants. Over these 7 years Now&After has become a full member of the world community of video art festivals and has been represented in Italy, Germany, Spain, Ethiopia, Ukraine, Japan, Greece, India, Sweden, Mexico, Brazil, USA, Peru, the Canary Islands. 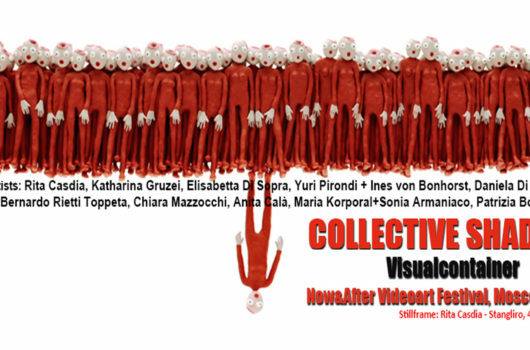 Every year Now&After programs are presented on the Italian VisualcontainerTV International Videoart Web Channel. Our project’s exhibitions and screenings were held in St. Petersburg (New Stage of the Alexandrinsky Theatre, St. Petersburg State University of Cinema and Television), Samara (Victoria Gallery, TK Ambar), Krasnoyarsk (Cinema House), Kaluga (Music House), Kirov (Vyatka Vasnetsovs’ Art Museum), Krasnodar, Saratov, etc. In Moscow Now&After was held at the Museum of Moscow and the RSUH, in the Polytechnic Museum’s “Electronic Living Room” and on the facade of the Darwin Museum, at the MARS Gallery and at the Timiryazev Biological Museum.